Twitch [Marksman] - One of the strongest openers in the game, Twitch's ultimate combined with Lethal Tempo allows him to dish an extraordinary amount of damage the second he pops out. Even if he gets popped by enemy assassins soon after, he'll have done his job as long as he gets his first few shots off. With the amount of attack speed he has, this generally isn't very difficult. Katarina [Mid] - Katarina is the ultimate follow-up to some massive AOE damage, making short work of the squishiest champions first and smashing in the rest with multiple AOE damage resets. If the rest of your team is fed, she can also initiate and Zhonya, letting her teammates clean them up as they crowd around waiting for her to come out stasis. Zyra [Support] - As far as supports go, Zyra may be the strongest support AOE mage out there. Capable of decimating entire teams by herself, catching one or two enemies in her snare guarantees massive damage. 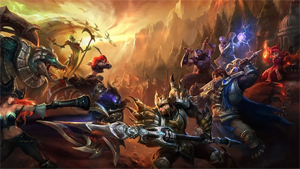 Jarvan IV [Jungler] - The turnaround king himself, Jarvan provides this team with some much-needed frontline ability. His attack speed boost also synergizes well with Twitch, maximizing this team's damage potential. Riven [Top] - In her current state Riven is nearly unstoppable once she gets 40% CDR and a few lifesteal items. She functions as a dive buddy for Jarvan, with the damage from bot lane providing cover as she hammers her way through enemy lines. This team is extremely flexible, and Jarvan doesn't need to focus on any one particular lane. Anyone can snowball hard through this game. Generally speaking, Twitch may not require peel depending on how fed the rest of your teammates are. Instead, he can opt to flank the enemy team while Riven and Jarvan run distraction. Talon [Mid] - Talon can outburst Katarina at close range, and also has the ability to quickly one-shot Twitch. Vi [Jungle] - Picking up Vi is a no-brainer, and she should be used on whoever happens to be strongest in the game, generally Katarina or Twitch. Pantheon [Top] - Pantheon is every Riven player's worst nightmare. Combine this with his point and click CC, and with good coordination, team fights are a breeze. Soraka [Support] - Picking up Soraka is excellent for canceling out any initial burst. This will prevent Katarina from picking up easy resets. Ezreal [Marksman] - All-in teams are particularly susceptible against poke champions. Ezreal is the perfect champion for whittling down enemies before they can mobilize for a full offensive. Overall this team is also very strong, but a little too heavy in AD damage.